I give ’em a week. Atari’s 1985 four-player arcade classic finally arrives to the Master System!… in late 1990… for Europe and Brazil only. What’s the deal with these fashionably late Master System ports (see also: Rainbow Islands in 1993, Ghouls ‘N Ghosts in 1991 etc.)? Nintendo licensing drama caused the wait for some of them, I’m sure, but since Gauntlet was only legally licensed for the NES for a short time, it doesn’t have that excuse. Surely the Master System could have used an awesome two-player co-op title in 1987 or ’88? Mr. Thor… axe down this wall. At any rate, Gauntlet‘s the same fantastical hack-and-slash action that you remember from days of yore. Four warriors, mighty and true, bade you select them to treasure hunt and monster bash. Thor the Warrior has strong attacks, but his chubby fingers prevent him from using magic. Thyra the Valkyrie defends herself with gusto, but her attacks leave much to be desired. Merlin the Wizard can cast a mean spell, but he’s incapable of hand-to-hand combat. Lastly, Questor the Elf can kill a bear with his bare hands, but his long-range combat skills are worthless. Thor’s not a coward, he’s just done with barfing demon heads. 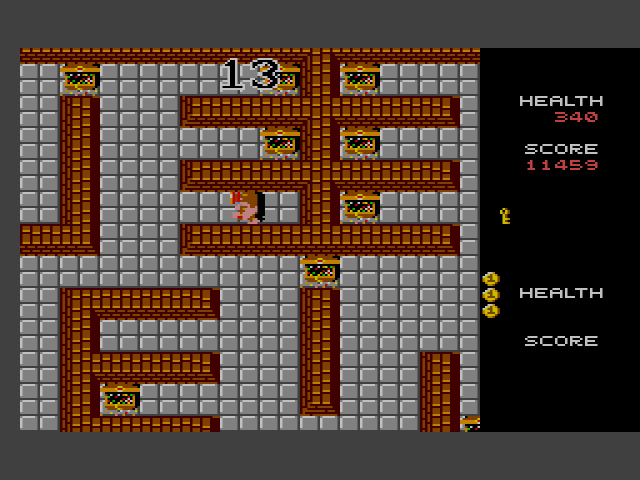 Each level is a top-down, non-linear dungeon that contains enemies, items, treasure, and food. When you first start the game, your Health begins at 2,000 and steadily decreases as you explore. If an enemy attack hits your person, your health decreases further. This is offset by eating food or drinking cider, both of which should add about 100 health. Items range from potions that increase your attack or defense, to keys that open up walled off areas, to amulets that provide invisibility. Treasure is strictly for points and not always worth getting, particularly if you see it surrounded by swarms of enemies. A bonus stage filled with treasure and no enemies! Collect to your heart’s content. Enemies emerge from generators that look like boxes. Until you destroy the generator that’s churning out the enemies, they will continue to appear. There’s only a handful of enemy types, but they’re all bastards in their own way. If Ghosts touch you, they take off a large chunk of life then disappear. Sorcerers flicker on and off the screen so they’re harder to hit. Death is impossible to kill, and if he touches you, he’ll steal 200 health before he disappears. Thor longs for the neon embrace of Death. Most dungeons either offer exploration, aggressive combat, or a mix of both. Thankfully, you don’t have to pick up every piece of treasure or kill every enemy to beat the level. Once you find the Exit, you can leave at any point. After level 8, the dungeons are all randomly generated. There are 125 different dungeon layouts in the game, but if you’re good enough, you could potentially play the game forever. There is no ending, and the levels will eventually begin to repeat. Thor can’t help but lick the sour green apple walls. Gauntlet is best enjoyed with at least one other person. The original arcade game was four-player, but since the Master System never had a four-player adapter, only two players can play here at the same time. It’s better than nothing. The tireless swarms of enemies are overwhelming if it’s just you taking them on, regardless of which character you choose. If it’s you and a friend, the onslaught is slightly more tolerable and certainly more fun. 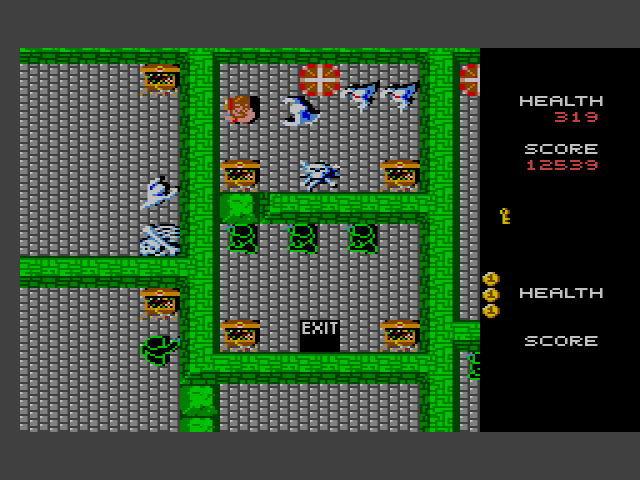 I’ve never rated Gauntlet it’s like a second generation game (i.e. Play for high score) but with third gen visuals. The console versions really need a quest mode so that you feel like you progressing rather than firing virtual coins into the game. Something the Mega Drive version of Gauntlet 4 thankfully added. However I will say the Master System version is a fantastic port of, for me at least a average coin op. 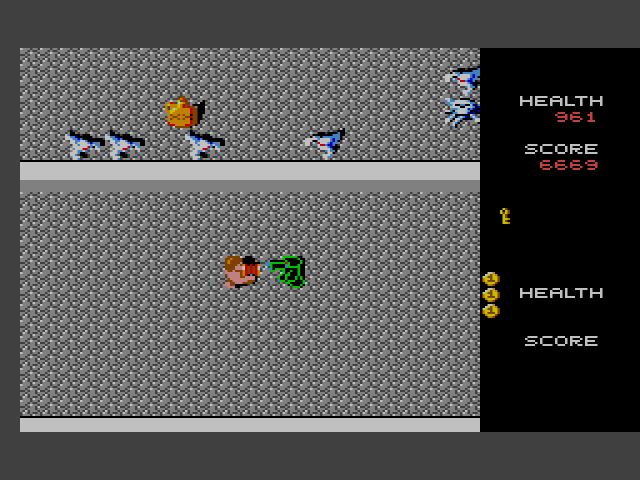 And yes Gauntlet was ported to every home computer going in Europe as well. 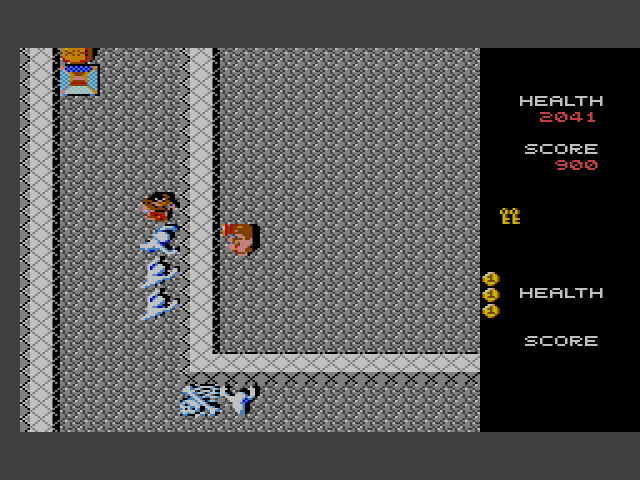 I think Gauntlet’s a fine game, just 1990 is way too late for a port. For crying out loud, the NES saw its port in 1987! Huh. Well, hopefully Brazil enjoyed it. I for one would have been happy with a decent Gauntlet port when I has a SMS. I played the NES o e which was a real early game. And it didn’t quite do it for me. I liked the NES port, which emerged in some time in ’87. If only the Master System port had debuted around the same time. 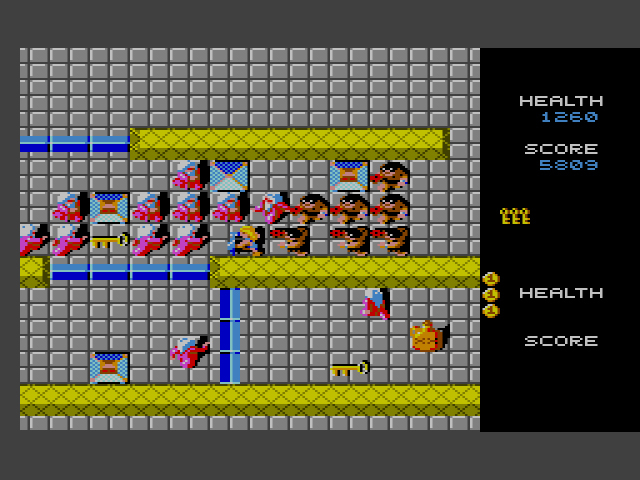 I’ve never cared for Gauntlet, something about it just never clicked for me with it. Honestly never knew there was a non-NA Gauntlet port for SMS. I was introduced to the game via an arcade machine at a pizzeria, like I am sure many my age were, but I never owned a home port until I got it on my GBA on a compilation with Rampart. The concept sure is sound, though, especially with more players — Gauntlet Legends saw regular rotation on the N64 when I was in college, and always it was all 4 members of the D&D group hacking away together! Yeah, Gauntlet Legends was the hotness for some of my friends in high school. Never tried it myself, but I should since I like the Gauntlet formula and wouldn’t mind playing an updated version. I’m pretty sure Australia only got a small selection of Europe’s SMS releases, and Gauntlet was still around in arcades when I got my SMS at the end of 1990. This was therefore a welcome port and a regular rental for co-op play. Not something I’d really bother to play solo though. I believe it’s true, but I have yet to experience it. Granted, the rest of 1990 will be pretty underwhelming. 91 and 92 have a few gems though. I’m looking forward to your review of Asterix, although that’s a way off yet. Rack up another good arcade port for the Master System that would have been great if it could have been released earlier and in the USA as you said. For those few Master System fans that import games, this one works fine…be sure to keep a Power Base Converter on hand for the glitchy ones though! Judging from ebay, the best selling Master System item is the console itself, so there is a lot of ground to explore for most that are just getting into the console. Other imports that do the system proud will certainly be on the way. 1990 was when the Gauntlet II 4-player port was released for the NES, so yeah, this port would have died in the US, despite its quality. As a US Master System owner I would’ve loved to have a copy of this game. Even after the Genesis was released I was still buying MS games with the Power Base converter. Never understood the appeal of Gauntlet. It gets boring within 5 minutes. Coop doesn’t help because you’ll be racing for food or destroying it with stray shots. Fine port of a fine game, but it’s gotta be played with a friend. 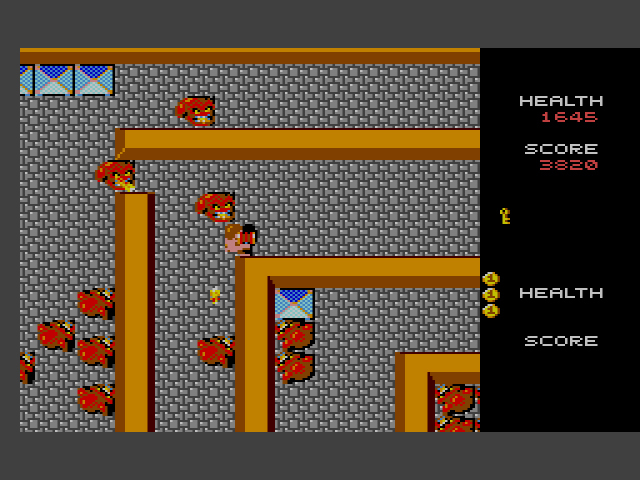 On your own, Gauntlet is pretty dull. I’d argue Gauntlet is one of the MS’s best arcade ports too. It’s not up against much, but it does the job. There would still be some good releases for the MS ahead. I think the quality of some of the Europe only games will surprise you. Lucky Dime Caper is good, plus NES inspired Ninja Gaiden and Master of Darkness (a Castlevania clone essentially) are worth the time, to name a few. I hope so. It’s not like these games have been all terrible, just confusing. I don’t think most developers knew what to do for the poor Master System.